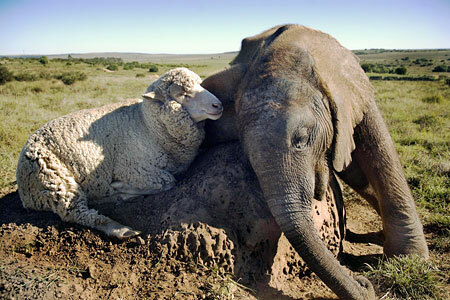 Yes an elephant in South Africa is now best friends with a sheep! The orphaned elephant Themba was introduced to Albert the sheep. To start with Themba teased Albert but now they play and cuddle. They will stay together for another 18months before Themba is released when he turns 2 years old. This is not the first time that different species have been used to comfort and mother abandoned offspring. In fact it also happens naturally in the wild. To learn more about altruism in nature check out Richard Dawkins ‘Selfish Gene’, available from all good bookshops and on line stores.